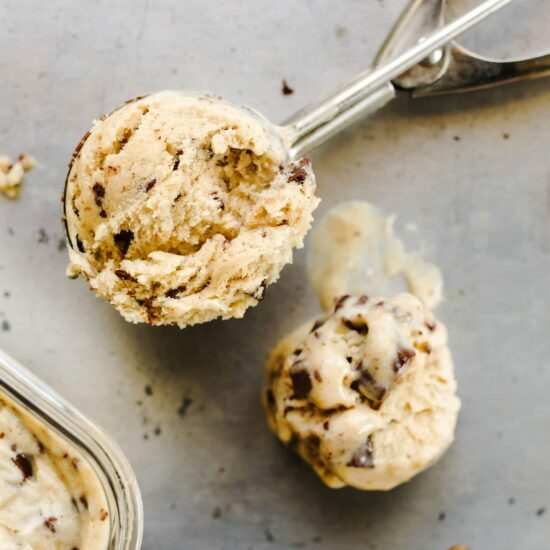 Roasted Banana Chocolate Chunk Ice Cream is full of rich caramel and vanilla flavors with chunks of chocolate throughout. Egg-free recipe! Taste: Kind of like bananas foster meets ice cream with a bit of chocolate. And if you add in the bourbon it takes the flavor profile to a whole new level! Texture: Ultra smooth and creamy with crunchy bites of chocolate. Ease: Super simple and easy, though this recipe still calls for an ice cream maker. Pros: Fun and flavorful homemade ice cream! Cons: Takes some patience before you can enjoy a scoop. When the high temperature for the day is expected to exceed 115°F here in Phoenix, ice cream is practically a necessity. Right behind central air conditioning and modern water systems. When it’s this scorching hot, I want to crawl inside my freezer the moment I open it and feel that cool gust of air. Instead, I settle for a frosty treat. There’s many ways to make ice cream, and since I wrote a whole book about ice cream sandwiches I’m extremely familiar with the topic. So I’ve included some insights and tips below, but this recipe truly is very straight forward. There’s the super simple no churn ice cream method, which is ridiculously quick and easy, but sometimes overly rich and sweet. There are other methods that don’t use an ice cream machine, but I find they don’t produce the same velvety smooth texture a machine does. When it comes to using a machine (I like this ice cream maker), there’s two types of recipes. There’s the French-style, which involves cooking an egg custard over the stove. This is much more time consuming and hands-on, but yields an extremely rich, smooth, creamy, and soft premium ice cream. 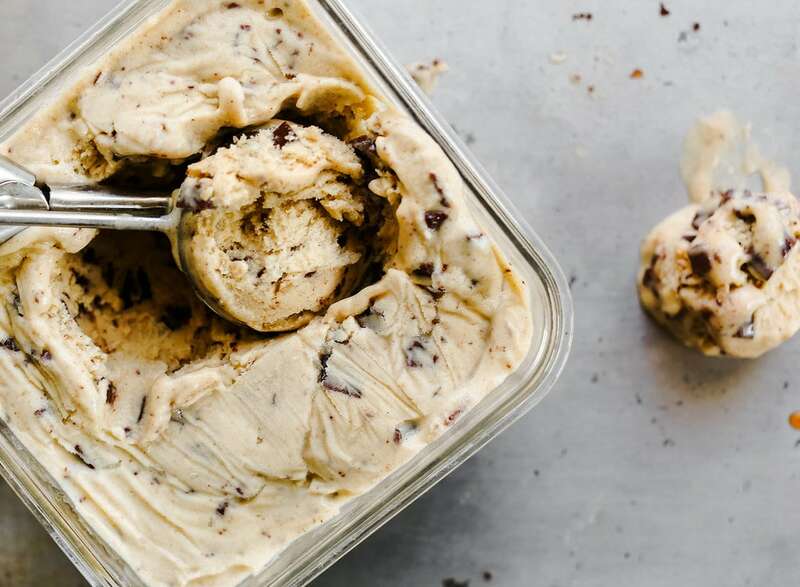 Then there’s the “Philadelphia-style,” which is what this Roasted Banana Chocolate Chunk Ice Cream recipe is all about. After roasting the bananas, just blend together the ingredients, chill them until they’re cold, then churn the mixture in the ice cream machine. It’s a good balance between the easier, but possibly too rich or too icy recipes, and the more difficult and time consuming custard recipes. I hope you’ll try it soon! 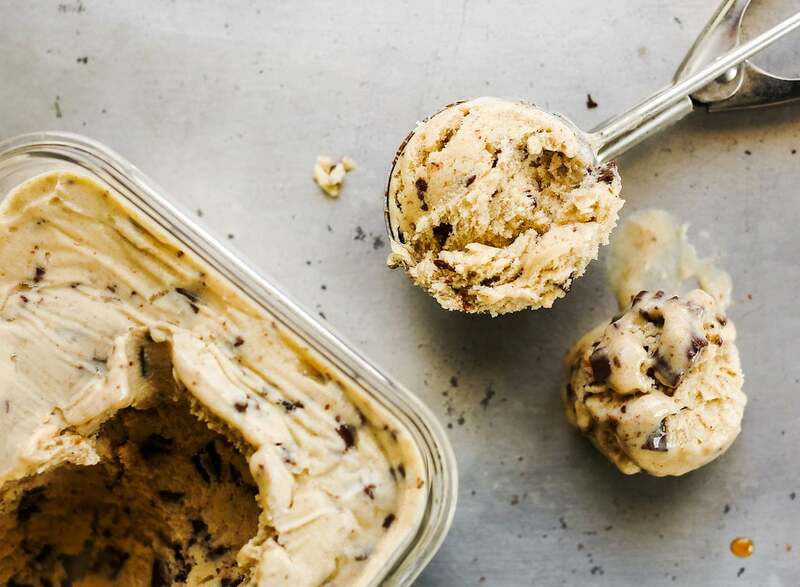 If you make and enjoy this Roasted Banana Chocolate Chunk Ice Cream recipe, be sure to snap a picture and share it on Instagram, tagging #handletheheat, so we can all see your creations! The bourbon is optional in this recipe, but it adds tons of flavor and the alcohol helps prevent the ice cream from getting hard and icy. Note: the mixture MUST BE COLD before it goes into the ice cream maker. If it’s too warm, it will remain soupy and never churn into thick ice cream. In a medium baking dish toss the bananas, butter, and 1/2 cup brown sugar. Bake for about 40 minutes, or until soft and caramelized. Pour the bananas and gathered syrup into a blender. Add the milk, cream, salt, and vanilla paste. Puree until very smooth. Cover and chill the mixture for at least 8 hours. Pour into an ice cream maker and freeze according to the manufacturer’s directions. During the last minutes of churning sprinkle in the chopped chocolate and bourbon. Transfer to an airtight container, press plastic wrap against the ice cream, and freeze until firm, at least 2 hours. The flavor will ripen the longer the ice cream freezes!